How much does a puppy cost? The answer can be eye-opening if you are a first-time puppy owner! 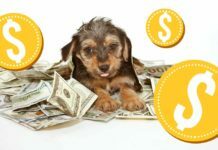 It can be especially challenging to figure out why the costs of buying a puppy are higher with one dog breeder than with another – even if both breeders are offering the same dog breed puppies for sale! It is these less-known expenses that can make determining an average puppy price so confusing! 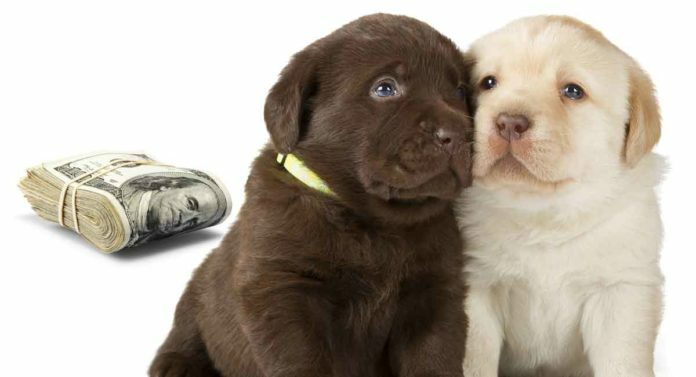 In this article, learn how breeders calculate their answer to “How much does a puppy cost?”, and find out what can cause those costs to increase or decrease. How much does a puppy cost to buy? When you start shopping for a new puppy, it won’t take long to learn there are expensive puppies, low price puppies and middle price puppies! Another thing you’ll notice quickly is the difference in price, depending on where you get your puppy. Purchasing a puppy from a dog breeder typically comes with a higher puppy price than adopting one from the local rescue shelter. For example, the typical adoption cost for an adult shelter dog is around $100. For a puppy, and especially a purebred puppy, that cost may be anywhere from $200 to $500. Of course, you know the fees you pay go to a good cause. Plus, there is no stressful haggling. Microchipping and spay/neuter are typically included, as well as all required vaccinations. The puppy can be returned at any time if health or other issues arise at home. Your new pup may even come with a puppy starter kit including basics such as a leash, collar, ID tag and some food and treat samples! And often, adoptive parents are also invited to participate in complimentary or low cost dog training held at the shelter to encourage a happy permanent match for each shelter puppy. The entire cost scenario shifts when you start to research purchasing a breeder-born puppy. This is especially true if the breeder you want to work with has show or championship credits to their breed line name! Here, your typical cost can range anywhere from $400 to $2,000+ for a single puppy! Also, typically this cost range is not for purchasing a show-quality puppy with breeding rights. This cost range reflects the purchase of a pet-quality puppy who will be spayed/neutered. If you want to purchase a breeder-born puppy for showing or breeding, expect your purchase cost to double, and then some. 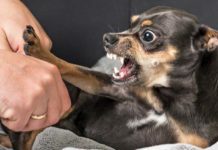 One recent article focusing on the costs of acquiring a puppy from Westminster championship parent dogs cited puppy costs of anywhere from $8,000 to $25,000+! What possible reason could there be for such a high price tag? The truth is, there can be lots of reasons. 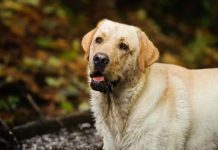 The more reputable and health-focused the breeder is, the more reasons there may be. 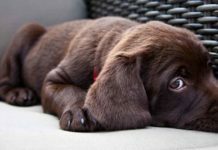 Figuring out, “How much does a puppy cost?” and “Why does the cost seems so high?” often boils down to putting yourself in the breeder’s shoes. If you are a dog breeder – even a hobbyist – you essentially have a business to run, and that business is dog breeding. Here, let’s also assume you are a reputable breeder who places parent dog and puppy health above profit (i.e. you are running a tight ship and are not in the puppy mill business). With all this in mind, let’s take a look at some of the basic costs you will incur to run your business effectively. We will define this as breeding healthy puppies and placing them in suitable forever homes. The breed of dog can have a great influence on the cost of pre-screening and health testing parent dogs. 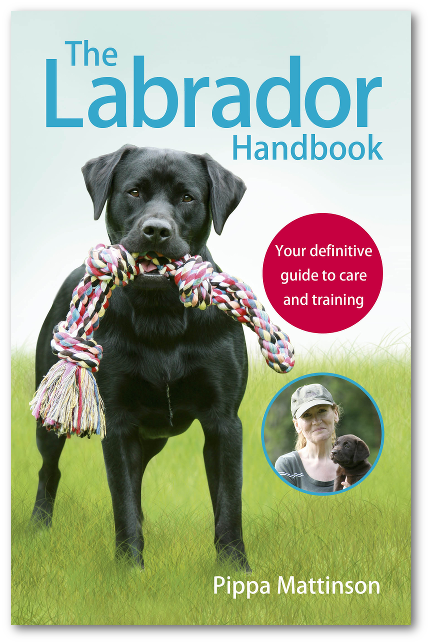 Some dog breeds, such as the Labrador Retriever, simply require additional pre-screening for expensive and complicated genetic (heritable) health conditions such as hip and elbow dysplasia, exercise-induced collapse, and PRA (progressive retinal atrophy), which can cause blindness. Expect Labrador health tests to cost anywhere from $250 to $750+. This cost is for each individual test. To test both parent dogs, double that cost per test and then multiply it by the number of health tests needed, and it is easy to see you can be looking at anywhere from $500 to several thousand dollars before you can even start the breeding process! 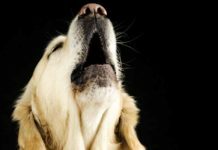 Reputable breeders may breed their own in-house parent dogs, but for the sake of genetic diversity a breeder may also contract for stud services. This may cost anywhere from $500 to upwards of $2,000 per stud service, depending on the stud dog’s own kennel and show lineage. 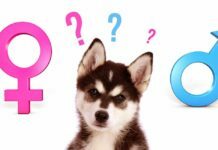 Once a female dog does conceive, the fun really begins! There are all kinds of health issues to watch for as the pregnancy progresses. Pregnancy can require everything from special fortified food and neonatal vitamins to periodic ultrasounds and birthing assistance. Some breeds, such as the unfortunate Pug, cannot give birth naturally and will always require C-section birthing. These costs can range from $2,000 (for an uncomplicated birth) to $7,000 and up (for complications during pregnancy or birthing). Once birthing begins, the breeder faces a number of additional costs. Puppies born prematurely or late may require veterinary assistance, including C-section. If the mother experiences health complications and cannot nurse, the puppies may need to be incubated and formula fed. Even if the pregnancy, birth and initial nursing goes well, the weaning process has its own associated costs, including special weaning puppy food, vitamins and supplements. These costs can vary from $100 to $200+ per puppy. Required vaccinations can vary based on where the puppy is born, since different states and countries have their own regulations. Breeders may spend anywhere from $100 to $500+ per puppy on required vaccinations. De-worming is a bit less expensive, averaging around $25 to $50 per puppy. If the breeder is affiliated with the American Kennel Club, the United Kennel Club or another show organization, there will be registration fees associated with each new litter of puppies. These fees average $25+ per litter, plus an extra administration fee per puppy registered. The mother dog will need special food, vitamins and supplements during and following pregnancy, as will her puppies. The breeder can count on spending $100 to $200 for these supplies. The new puppies will need to be microchipped and have their I.D. tags, puppy collar and leash sets ready to go before they can be released to their new forever homes. This may cost anywhere from $50 to $100 per puppy. Breeders must maintain a website that is updated with new litter information to help with placing their puppies in quality forever homes. Costs for website development, hosting, email services, and advertising and marketing can range anywhere from $50 to $300+ per year. Each puppy must have a veterinary checkup before release to the new owner (even if the new owner is also required to have that puppy checked out by their own vet). This checkup typically runs anywhere from $125 to $300+, depending on any testing that needs to be done. Now, let’s take a quick look at some examples of self-reported breeder costs for different dog breeds. Welsh Springer Spaniels: This breeder of Welsh Springer Spaniels states that the cost of raising a healthy litter averages $15,828, with a range from $7,744 to $23,912. Miniature Goldendoodles: This breeder places the average cost of breeding and raising a litter of healthy puppies at $23,500, with a range from $20,000 to $29,000. Great Danes: This Australian Great Dane breeder offers a “conservative estimate” of breeding a litter of Great Dane puppies, coming in at $8,700 for a litter with no complications. Alaskan Malamutes: This breeder outlines a cost range per litter from $7,788 to $23,899. The former cost is for a litter of 4 puppies with no complications. The latter cost is for a litter of 12 puppies with complications. Pomeranians: This Pomeranian breeder cites costs of $2,780 per puppy, or a total of $8,340 for a litter of three puppies. From this short list, you can see how frequently the cost of breeding and raising a litter of puppies can quickly outstrip any so-called “profits” from the sale of those puppies! Does breed matter with puppy cost? As with all commodities, your puppy dog price tag can go up or down for a variety of reasons. Here are five of the most common reasons for that pricey puppy! Supply and demand is perhaps the top driver of price. In other words, if there are more people who want a particular breed of puppy than there are available puppies, you may find yourself on a wait list with an escalating price tag lurking for you at the other end. Puppy trends can also ebb and flow. As an example, when President Obama took office and then very publicly adopted two Portuguese Water dogs for his dog-allergic daughters, the “Portie” suddenly experienced a surge of popularity that hasn’t yet waned. Some breeds are also simply more expensive to breed and rear. Miniature and toy size breeds and brachycephalic (flat-faced) dog breeds may need birthing assistance such as a C-section in the veterinarian’s surgical suite. This drives breeding costs up fast. Some dog breeds also have more known genetic health issues that require pre-screening and testing of parent dogs. Health testing can be costly and this drives up the breeder’s cost per litter. Many breeds of dog enjoy special popularity in particular areas. These places are likely to have more breeders of those dogs, so they are likely to incur fewer travel costs for mating, and their prices will become more competitive. Luckily for hopeful Labrador puppy purchasers, Labs are basically popular everywhere! Regardless of what you are shopping for, it is always smart to shop around. This is the only way you can figure out if what you are being charged is fair and reasonable! As you do your research to learn, “How much does a puppy cost?” it won’t take you long to notice that different breeders may be charging very different prices – even for the same breed of puppy! Why is this? How can one breeder charge a price that seems too good to be true and then another breeder seems to be laughing all the way to the bank? The truth is, if the price of the puppy you have your eye on seems too good to be true, it probably is. You need to do your research to know for sure. Based on today’s puppy mill statistics, a puppy with a very low price tag is more likely to come from a puppy mill. A puppy mill puppy may be cheap on the front end. But when you purchase a puppy that comes from parents that haven’t been health tested, you potentially open yourself up to a wealth of unexpected vet costs and heartache later in your dog’s life. The platinum puppy with the very high price tag also requires some extra research. Is that breeder breeding puppies from a championship show dog line? Does that dog breed require extra health testing or birthing assistance? Is there a strong demand for puppies from that dog breed? If you don’t see an obvious reason for what feels like an inflated price tag based on your research to date, the best policy is to ask. A health-focused breeder will be willing and able to answer questions about cost. So what’s the final price of a puppy, and why? We’ve seen that rearing a litter of pups has lots of hidden costs for their breeder. Look at lots of litters for sale in your area before you start calling breeders. This will give you an idea of a benchmark price for your preferred dog. Beware of puppies priced exceptionally high, or exceptionally low. Don’t be afraid to ask lots of questions of your breeder – a good breeder will love your concern! And finally, bear in mind that the initial purchase price of a puppy might be enough to make you gasp, but it is still only a fraction of the lifetime cost of owning them. We hope this article has answered many of your questions about puppy price! If you have more, why not put them to our other readers in the comments section? Hawn, R., “The price of puppies for sale,” Bankrate, 2009. Nolen, C., “The Cost of Raising a Responsibly Bred Litter of Puppies,” Cryslen Welsh Springer Spaniels, 2015. O’Malley, C., “Cost to Breed and Raise a Litter,” O’Mal Malamutes, 2018. Korevaar, M., “Breeder Education: Cost of a Litter,” Doberman Pinscher Club of America, 2010. Freeman, M., “Portuguese water dog owners fear Obama effect,” Today/Associated Press, 2010. St. John, A., “How Much Is That Doggie In the Window? The Surprising Economics of Purchasing a Purebred Puppy,” Forbes, 2012. Breton, T., “Why Are Your Puppies So Expensive?,” Pom Beach Pomeranians, 2014. Picchi, A., “Want a Westminster pup? Prepare to Pay Up,” CBS News, 2016.